Sift the flour into a food processor. Add the salt. With the motor running, add the eggs, one at a time, to form a dough. You might need to bring the dough together by hand - but don't add water. Knead for 5 minutes, wrap in clingfilm and leave in a cool place (but not the fridge) for 30 minutes. Blitz the garlic and pistachios in a food processor. Add the watercress and mint and blitz again. Slowly add the oil to form a textured paste. Season. Divide the dough into 4. Roll each piece through a pasta machine 4-5 times till smooth, then roll each piece into a sheet 2mm thick. If you don't have a pasta machine, use a rolling pin. (Keep the dough you aren't working on wrapped in clingfilm.) Cut the dough into 6cm squares. Put a good teaspoonful of pesto in the centre of one, dampen the edges, cover with another square and press the edges to seal. Repeat with the remaining dough. 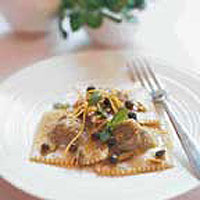 Lay the ravioli on a clean tea towel, dusted with semolina. Heat the oil gently with the garlic, lemon zest and juice and oregano. Season, stir in the capers and keep warm. Cook the ravioli in boiling salted water for 3-4 minutes, until al dente. Drain, pour over the oil and serve, scattered with more mint leaves.